Now they have a lot of explaining to do. It’s one thing to allow for “freedom of speech”, but Eng’s op-ed is simply irresponsible. In addition to the racist statements he writes about the Black community. The op-ed itself reads with a whiney and misguided voice, filled with faulty logic. I also read Eng’s earlier piece entitled “Why I Hate Asians“, and I came to the same conclusion with Power and Politics in that Eng’s work is that of a deranged writer. Now I usually give folks the benefit of the doubt, but Eng’s tone of writing doesn’t really convey any sincerity in trying to spark dialogue about racial stereotypes and discrimination. And then there is something to be said about a person who is a self-proclaimed “Asian Supremacist” and calls his column “God’s Universe”. This link displays a petition against the article sponsored by several major Asian Pacific American civil rights and advocacy groups. It also lists other relevant links, including a downloadable PDF of the original column (which can no longer be found on Asian Week’s website). The incident reminds me of some heated blog discussions a few months ago about the state of relations and lack of understanding between Asian and Black folks. I fear we all may remain perpetually as crabs in a barrel and continue playing Oppression Olympics. The Asian Week let-down certainly doesn’t help the situation. Still, I feel mostly sadness, rather than anger, towards Eng because I think that using this approach is to operate from self-hate. I wonder what Eng is like in person. Does he have any children? What kind of people is her surrounded by? Who does he call his community? From where does he draw inspiration and hope? This week the Detroit Free Press published a pretty good article about local activists in Michigan who are speaking out about global warming through workshops and presentations for community organizations, neighborhood block clubs and church groups. The individuals highlighted (including my friend and former employer) are part of a cadre of volunteers trained by Al Gore and The Climate Project and who are now raising awareness about climate change in their local communities. The Climate Project website is very interactive and includes a calendar of events for you to see what local activities are taking place in your state. The presenters’ tasks are to be available to talk about climate change and make the technicalities behind global warming more accessible to non-scientists (i.e. regular folk). So if you want to do something tangible about combatting climate change, get in touch and tap into this resource to bring them out to your own community organization. Last night I went to the Top of the Rock to see New York City’s skyline. The view was fantastic. It was raining, so I couldn’t get a good shot of the city, but here’s a photo from Gothamist. Today I pack up my belongings into my car to complete my move to New York City/Brooklyn. While living in Detroit, I remember lamenting over the handful of folks who decide to leave the city each year, for whatever reason. It is not my intention to be that person who couldn’t see the beauty of what is taking place in the city. Rather, I’m on a pursuit to become a landscape architect/designer and trying figure out how to pull together my background as a community organizer into this new path. In putting a lot of my writing energies into composing a reflective and honest personal statement for grad school applications, I realized that much of what I wrote was about Detroit and its people that impacted my life. Before going to see the newly opened MOCAD, my friend and I spontaneously decided to enter and explore the Michigan Central Depot. It was surprisingly easy to get in from the tunnels. 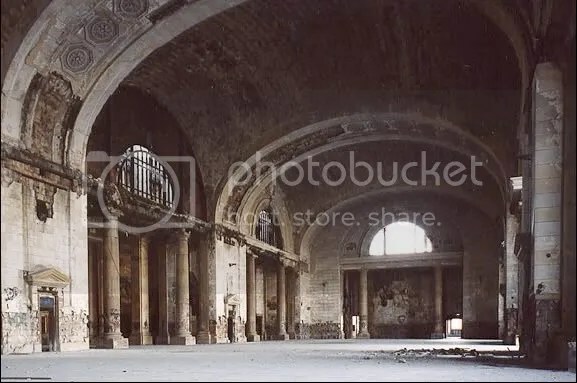 We were walking in darkness for a minute, before suddenly stepping into the expansive main lobby/waiting area (represented in the photo above courtesy of Forgotten Detroit). A snow storm had come through the city two days ago, so mounds of snow sculpted by the wind were all over the floor and staircases. We only had time to look around the third (some kind of vault/archival room) and fifth (hotel rooms or offices) floors. I still can’t really believe I was inside the building — had there been more time and had I dressed warmer, I could have spent much longer inside, just sitting, soaking and reflecting. I hope the fate of this building, like other wonderful buildings in Detroit, will not go down the path of demolition. Afterwards, my friend and I had an interesting conversation about sustainability and urban cities. Inside the rooms, we had found many light fixtures and other materials wasted and deteriorating, as though people just left everything behind and didn’t think look back. At the same time, the architecture and building materials used to construct the station seem solid and strong enough to withstand time itself. Aside from the aesthetics, there doesn’t appear to be much structural damage. I don’t think the box-like buildings we find our Wal-marts and Targets today can measure up to the Michigan Central Depot. With the right amount investment, imagine the possibilities of how we can reuse this building.